Three months after President Obama essentially passed the DREAM Act without Congress, a federal agency started accepting applications for deportation deferrals on Wednesday. 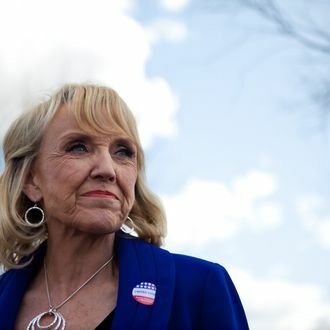 Young undocumented immigrants lined up for information sessions in major cities around the country, but in Arizona details on how to obtain papers to work legally in the United States came with a jab from Governor Jan Brewer. In response to Obama’s policy, Brewer issued her own executive order, telling state agencies to deny driver’s licenses and other public benefits to those who obtain documentation through the federal program. According to Reuters, roughly 80,000 people in Arizona could qualify for the program, and Brewer argues that allowing them to receive state-issued identification or benefits would “have significant and lasting impacts on the Arizona budget, its health care system and additional public benefits that Arizona taxpayers fund.” She added that the program “does not confer upon them any lawful or authorized status and does not entitle them to any additional public benefits.” As NPR notes, it isn’t clear that states have the authority to decide whether immigrants who’ve received deferred action can have driver’s licenses, but if anyone wants to figure it out with a lawsuit, we bet Brewer is up for it.